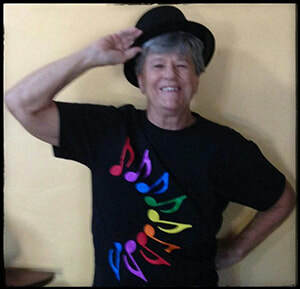 I’m 65, a licensed massage therapist, and in my 5th season singing Bass in Desert Voices. I enjoy life, give great massages, and I travel with my wife of 38 years and our daughter every chance I get. I am an Air Force veteran, have a B.A. in Psychology as well as a Doctor of Ministry degree. I served as an ordained minister for over 20 years, in NC, VA, West VA, TX, and CA--until 11 years ago when, at the strong urging of my doctor ("Reduce stress and change your lifestyle or die early!") I resigned my pastoral position. I moved to Tucson to study massage therapy at the Desert Institute of the Healing Arts. I started singing when I joined a high school choir and discovered the choir comradery. I was hooked, and over the years I sang in church choirs and occasionally in community choruses. I was invited to sing with DV by the partner of a singer who, when she heard I liked to sing, spent the next half hour telling me how great the choir was and how much I would enjoy singing with them. How could I resist? I came to rehearsal, was welcomed warmly, was challenged by the music, and became part of a family. In my early years of church work, I was quite conservative in most things, especially in LGBT issues, and acted accordingly. Then, in 1991, I was randomly selected to serve on the Committee on Human Sexuality at the General Assembly of the Presbyterian Church (USA). We were to make recommendations for action on a Report that favored full acceptance of LGBT folks. While studying the report and interviewing people from all sides of the issue, I came to the realization that the people who more clearly demonstrated the gospel were from the LGBT community. I recognized my own homophobia. And when I apologized for it in an open meeting, it made the NY Times (which was among the many news agencies following the debate). The More Light Presbyterians accepted my apology and pronounced forgiveness. Thus began my lifelong commitment to promote equality for all persons. It's important to me, as an Ally, to raise my voice with my sisters and brothers until we stand in equality in life as on the stage. This is WHY I SING. WILL: I am 75, an avid reader, armchair genealogy researcher, and above all a Singer! I am becoming healthier again, since my daughter now "drags" me to the gym every week. I am in my 2nd season with Desert Voices. I was born in Atlanta, GA, and came to Tucson at age 11 in 1950. During Christmas break in 6th grade, my voice changed; I went from singing soprano in the Christmas program, to bass when I returned. I was in the first graduating class from Catalina High School in 1957. I got my BA and Master's Degrees at the UofA. In 1966, Becca's mother & I moved to the San Francisco Bay Area, and I lived there for 42 years. After I was single again, I sang professionally in the SF Symphony Chorus and then the SF Opera Chorus, plus singing solos and roles with other Bay Area companies and churches. My favorite non-singing job was running a snack table at UC Berkeley's English Language Program for college students from all over the world. I loved visiting with them; I even got to sing for them! After I retired, I lived for four years in rural east Texas with family. Then, a year and a half later, I moved to Tucson to be near Becca. BECCA: I am 44, an avid birdwatcher, and a transplant to Tucson from the SF Bay Area. I ought to be a native, though, since my parents met & married in Tucson and only later moved away and had me, an inherent desert rat. I graduated with a BA in Dramatic Art, minoring in Ethnic Studies, and achieved Phi Beta Kappa while attending U.C. Berkeley. This is my 10th season with Desert Voices. As an adult, I kept seeking warmer climes, and new birds to see, within the Bay Area until my second company-wide layoff in 4 years prompted me to follow my mother and stepfather to Tucson, a birder’s mecca. But I was very lucky to grow up where and when I did, with the family and community and schools and church that I had--I was never taught to hate myself or others. I work in accounting, love to write, and I live with Pat, my amazing, funny and wonderful partner of 6 years; 3 cats; and a pit bull, whose kisses, grins and wiggles have taught me to love this much-maligned breed. WILL: Even as a kid, I hummed Mozart-like tunes while I was playing with my bottle-top armies, their commanders my toy soldiers, and their stuffed-animal generals. (Well, it was during WWII!) In addition to classical and church music, my family liked Broadway shows and operettas, and I remember us all singing around the piano with Dad playing an oompah bass. Later, in Tucson, Dad would pick all of us boys up after school and we would ride home, four basses singing "The Lord's Prayer", "How Great Thou Art", etc. My first solo in school was in junior high: "Let My People Go". I was moved by the power of the words and the music, and that has been my main inspiration in singing: great music wedded to great words. BECCA: I grew up with music: Dad sang in church choirs and Mom played piano. Even my tone-deaf step-dad performed in church musicals. Julie Andrews records sang me to sleep when I was little; when I got a bit older, I hummed along to the Star Wars soundtracks, not just the melodies, mind you, but the ENTIRE soundtracks. I think they’re still committed to memory! I regularly sang in school choruses, later church choirs, and learned to play piano, clarinet and oboe, playing in various youth orchestras. The concept of music-as-ministry in my life first really hit me when I performed in Hair at my Catholic high school (!!). The spirit of it, the social justice message, set to really cool tunes, still rings true. Years later, another huge highlight for me was singing Mozart’s Requiem here in Tucson during the worldwide Rolling Requiem on the first anniversary of 9/11. Music, specifically singing, has become my ministry, of sorts…not about religion or God, as I’m adamantly agnostic, but about justice, spirit, fun, healing and community. WILL: My daughter! Before I moved back here, I visited Becca several times and attended Desert Voices rehearsals each time. I was impressed with the type of music they sang and the quality of their singing. Also, I was moved by the chorus's friendliness in welcoming "ol' Dad" to rehearsals, and I could see how much the group liked and appreciated my daughter, and she them. So when I came to Tucson to live, it was natural for me to join DV. I sang two summers ago in the gathering in Tucson of all the LGBTQIA groups in AZ, a great experience, and I even got to sing a "duet" of several measures with Becca! Then, a year ago, Shawn came as our interim director and put me in the Holiday program as a grumpy Santa. I am so glad that this year the group has grown and has a really impressive governing board. I have always been sympathetic with folks who were "underdogs," especially in America. Groups who were discriminated against have always had my support, whether it was because of being against the war in Vietnam, or being racial or ethnic minorities or women. It took me a while to become aware of things LGBT, but I soon was convinced that I should "talk the talk". Then, when Becca came out, I discovered that it was a little tougher "walking the walk". Since then, as my brother told me, we have all grown. I told Becca that in my mind it was like a piece fitting into a puzzle; it was just right. Several members of DV have come up to me and said that they really appreciated how Becca and I act with each other, that their families were not so supportive of them. I was quite touched, as I have been several times when members have spoken up about their history. So I am honored to be a member of this joyful, talented bunch of singers and human beings! I guess I would be called an "ally", but I think of myself as FoF---Family of Family! BECCA: I joined Desert Voices because I had previously attended a fun and moving holiday concert, and my girlfriend at the time was already a member. I stayed after the breakup because I had found a home and family here. I am still here 10 years later! I love the variety of music. I love the high performance standards to which we’ve been held. I love how we welcome everyone. I don’t think I’d stick around if we were limited in composition or had to identify a certain way—inclusivity is too important to me, and while I enjoy hearing all-women’s or men’s groups, I much prefer to sing with mixed voices. I love how we lovingly challenge each other and our audience to learn and grow and heal, so often through laughter. And attending the 2012 GALA Choruses Festival in Denver together was an amazing experience, akin to the Olympics, joining our brother/sister LGBTQIA choruses from all over the world in song. I love how much fun we have. I have sung under a number of choral directors in my life, but my two extra-favorites have been right here with Desert Voices because of their breadth of knowledge and ability, commitment to excellence, humor, and friendship. But it runs even deeper than that: I love them as brothers. I love that my dad now sings in DV, too, and that my partner serves on the Board. It’s truly a family affair! I love how I have grown musically and personally through weaving Desert Voices into my life. I can’t think of a better place to sing. I am 75 years old, an Alto, and this is my 23rd season with Desert Voices. My partner Becky and I have been together for 15 years as of tomorrow! I was raised in Indiana and graduated with a BA in Health, Physical Education & Recreation. I moved to Rochester, NY and taught Physical Education & Health at the college level until 1983, when I moved to Sonoita, AZ with my husband & two children. I opened a restaurant there, The Cactus Flower, which I ran for 10 years. My marriage ended during that time, but then I met these women on motorcycles ……..! Not too long after, I sold the restaurant and moved to Tucson (to be with gay people! ), where I worked in the Parks and Rec Dept. until retirement in 2001. All my life I have been involved with singing. It is an essential need for me. I especially loved singing at Girl Scout camp where all music was a cappella, and I could harmonize to my heart’s content. I sang in church choirs for 30 years. I even formed a trio in the restaurant with two of my workers where we entertained our diners and sometimes out in the community. However, more quick public exposure came via a group photo published on the front page of the entertainment section of the Tucson Citizen. But you know what? The public announcement of my "gayness" made no difference to the people I worked with and saw on a daily basis. That, along with my DV family, has given me the strength and yes courage to keep coming out and supporting the LGBT community. As an older member of the chorus, it has been challenging at times as far as memorization is concerned. But, as some of us grey haired folk claim, we are preventing Alzheimer's by continuing to use our little gray cells! Being a part of this group has allowed me, over the years, to exercise my satiric sense of humor in the parodies I have written for a quartet composed of a variety of wonderful women with me as the “reining baritone". I thank all singers and especially the artistic directors, past and present, for indulging me. When I fantasize about retiring from the group, I begin to think about the people I would have missed getting to know had I done so. Not knowing these many fabulous people would have been a huge loss. And since my partner continues to encourage me and is a non-singing member of Desert Voices herself, previously as office manager and now as a Board Member, retirement is not even in the long range picture. As a mixed chorus, not only do we have men, women, and transgender people, we have all ages, backgrounds and personalities. We come together as a family and, together, we make wonderful music. I am so proud and thankful to be a member of Desert Voices. This is WHY I SING.